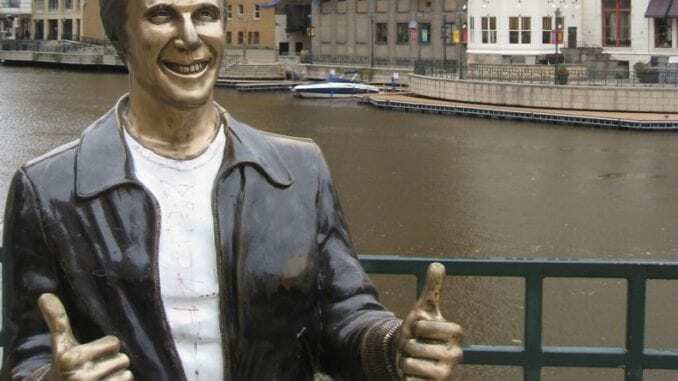 A 50-metre statue of Happy Days star Henry Winkler is set for construction right across the four-lane highway from Southland Mall in Winkler, Manitoba. Before Henry Winkler starred as Fonzie in Happy Days, he spent his teen years at a local pig farm. His performance with the hogs was so impressive that the town was named after him. In a candid moment Peters admitted that the construction of the statue was partially motivated by a desire to outdo the dinosaur sign that greets visitors to neighbouring Morden. The Henry Winkler statue is set for completion in time for the Harvest Festival in August.